Hands on Sexual Harassment: Has #MeToo redefined the Status Quo? 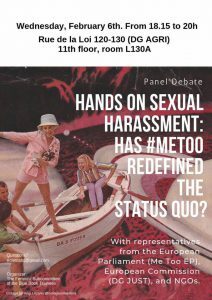 The Feminist Subcommittee of the Blue Book Trainee’s Committee of the European Commission, organized the panel debate Hands on Harassment: Has #MeToo Redefined the Status Quo? February the 6th.2019 at 18:00-20. 18.20- 19.00h: Presentations by each speaker (+/- 10 minutes per speaker). We would love to hear about your work, expertise or any other issue you have a particular interest in. However, it would be great if you could dedicate a few minutes on topics like the #MeToo movement, (the legal aspects of) sexual harassment and/or female minority groups. It is possible to use a PowerPoint presentation. 19.00 – 19:30h: Debate session, guided by the moderator. o Do you think #MeToo has changed anything at all? o Why is it important to address sexual harassment and why or why not we should consider sexual harassment a political issue? o Has #MeToo benefited all women? Do you think #MeToo has had an impact on diversity? o Does sexual harassment need additional regulation? Do you know any case where #MeToo made an impact on national ruling? How far should regulation on sexual harassment go? After the ban on catcalling in France, has anyone received a fine? o What role does culture, race, class, (sexual and gender) identity, baldness or working place play in sexual harassment? How do you think this mix shapes Brussels for women? 19:30 – 20.00h: Questions and closing.